Supplier of Electronic Hi-Viz Airflow Indicators for the LEV industry. 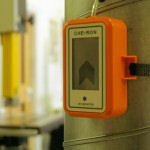 Monitair Ltd have developed, manufacture and distribute the unique Chevron electronic airflow indicator. The Chevron is designed to continually monitor the static pressure in an LEV system and reassure the operator that it is working correctly. A dynamic moving display indicates either correct operation or a fault condition, such as a fan failure, broken or blocked ductwork. The Chevron is powered by 2 AA batteries which last in excess of 14 months, and a battery monitor informs the user when these need to be changed. The unit can be calibrated in seconds for use across the range of 200 to 2000 Pascals, so one size fits all. With a very attractive price, minimal installation and an eye-catching design, it is not surprising that the Monitair Chevron is now in use 24 hours a day, across a wide range of LEV installations, including soldering stations, injection moulding machines, ducted fume cupboards, on-ship portable extractors and many more.